Warwickshire County Council (WCC) have embarked on a programme of organisational change. A key outcome from the corporate workforce and organisational development strategy has been the implementation of a corporate approach (by scaling up an existing process) to the acquisition of knowledge and skills through learning interventions. The timescales set were 6-8 weeks to standardise the corporate approach to the L&OD commissioning and business process, clarify its structure for the stakeholders involved and further develop an integrated approach to gathering and storing data that allows all stakeholders to access better planned and delivered learning services. Another key objective was to improve the level of management information accessible to decision makers. Identifying clear benefits for users as the existing process was not well known and the emphasis was more on the actors in the process i.e., the roles and the technology. · Ensuring key stakeholders were engaged and communications managed by mapping stakeholder interests, creation and distribution of a briefing to managers and involvement in the data collection. · Setup and run requirements workshops to review the As-Is process and focus group to identify the customer journey. · Compile and redevelop business processes from being Role based (As-Is or current state) to Process based (To-Be or future state). Potential areas for change or further investigation were also identified. · Keeping the customer informed with regular reporting on progress and performance check points. · Stakeholders became more engaged with the work as it highlighted the broad scope of the LD process and the impact scaling up the process would have. · Reviewed the As-Is process and streamlined it into the To-Be process. · Contributed to highlighting information system deficiencies affecting management reporting. 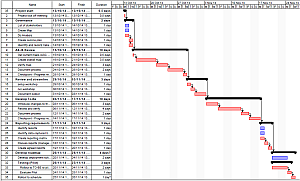 · Developed the implementation Gantt chart of tasks for the next tranche of the programme where output from the process and customer journey work are brought together with output from another aspect of the transformation programme the Maturity Matters benchmarking initiative. · Compiled a Development Report of the business process review, outlining the findings. · Turned around a stagnant project. Top level design of the Business Process.